Communicate with your guests how they want. Hotel MSSNGR is an innovative guest management system. It shows which of your services interest a guest on site, and what the guest is willing to pay for. You can use this information to point guests directly to the activities and promotions relevant to them. Say good-bye to printing deadlines. As soon as you enter any information on MSSNGR’s website, it’s on the guest’s mobile phones. Your hotel does everything to satisfy the most individual requests? Let your communication do the same. 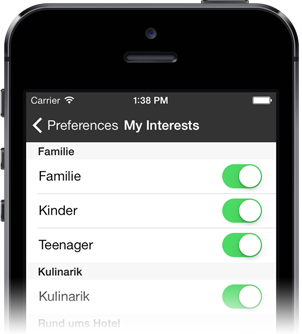 Individual interest filters let your guests decide what they want to be informed about. Everything your guests need to know on their mobile phone. You know everything about your guests. Except what they are doing in your property - except for MSSNGR. Send specific direct messages if you want to receive extra attention. Few things are as valuable as your guests’ feedback. MSSNGR makes giving feedback easier than ever.